Last Friday, a very good friend flew in from out of town. We decided to celebrate and indulge in a serious hankering for Mexican food. A big group of us chose Tortilla Coast in Logan Circle, conveniently located on the corner of 15th and P street. I always get nervous going out for Mexican; a guacamole appetizer is a must and margaritas usually veer toward the pricier end, making the meal hardly a cheap event. Tortilla Coast was a pleasant surprise. We managed to get there before the happy hour ended at 7:30 (happy hours that end past 7pm are hard to come by) and enjoy a delicious $5 margarita. 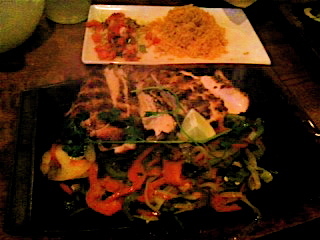 Guacamole was of course ordered, followed closely by sizzling Chicken fajitas. For less than $14, I had sliced chicken breasts, grilled veggies, warm tortilla wraps, and rice. There was more than enough for me to share with my friends around the table, who were also enjoying their meal decisions. My total bill was $30, including the fajitas and several margs, not bad for a meal out in the District.